Welcome to the Santinelli International Website! For nearly 45 years, we remain family-owned and managed, and just as passionate as ever about helping our clients succeed. Our "client-validated" and award-winning lens finishing equipment and service are at the core of the unique Santinelli Experience™. The entire Team, led by company President & CEO Gerard Santinelli, thanks you for visiting our website and we look forward to continuously exceeding your expectations. 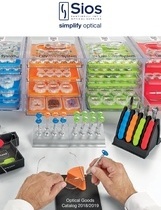 Measure the quality of your practice by the quality of your dispensed eyewear. 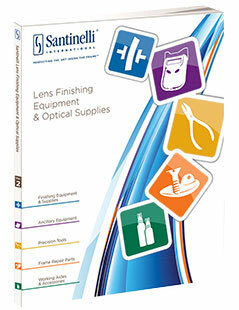 You can’t miss with any one of Santinelli's 13 retail lens edging systems available. Second best just doesn’t cut it when it comes to your in-office finishing lab. With any of Santinelli's lens edgers, be assured that you will deliver quality work to your patients -- every time. Precision blockers from Santinelli are a key component to the quality of your finishing lab and the deliverable to your patient. From specialty tabletop lens edgers to robotic edging systems with conveyor belt, Santinelli's robust industrial equipment can handle the high productivity needs of your lab “24/7”. Much of a lens edger’s accuracy depends on the information supplied by the tracer. As the originator of 3D tracing, Santinelli offers innovative tracer options to start the finishing process right -- for a perfect fit. Create Chemistrie™ Sunlenses & Layers automatically with Santinelli's Click Mode Software. Chemistrie™ magnetic “click-ons” fit seamlessly over primary lenses, eliminating the common problems seen with traditional clip-on eyewear. Santinelli's ever-expanding selection of high-quality optical tools and supplies will meet the needs of any dispensary. Complete your lab with Santinelli's ancillary equipment, including Less Stress, a highly precise manual drill for 3-piece mounts. When you put the best lens finishing equipment in your lab, you deserve the best service to back it up. Check out Santinelli's industry-leading Live Tech Chat, Video FAQs and more. Want to send us a compliment or provide a suggestion? We want to hear from you! Click Here to provide us with your feedback on a recent experience with Santinelli products or service. Visit Us At The Below Events!